The new immersive benchmark is the Cisco TelePresence TX9000 series and it’s an exciting product for the HB team to sell. It features modern design and classic functionality, while still enabling businesses to natural and effectively communicate with remote team members. The new immersive benchmark is the Cisco TelePresence TX9000 series and it’s an exciting product for the HB team to sell. It features modern design and classic functionality, while still enabling businesses to natural and effectively communicate with remote team members. The series includes the one-row TX9000 for up to 6 participants, and the two-row TX9200 for up to 18 participants. The systems are capable of delivering three simultaneous 1080p60* video streams and one high-definition, full-motion 1080p30* content-sharing stream for exceptional visibility. With modern design and classic functionality, the TX9000 Series delivers the ultimate immersive telepresence experience. TX9000 Features and Capabilities The following features help users to focus on their meetings, rather than on the technology: • Three 65-inch screens are positioned to reduce camera intrusion while maintaining eye gaze. • A state-of-the-art, three-camera cluster allows for greater eye contact and a continuous whole-room experience with no field-of-view overlap. • Uniquely designed, one-inch thin light reflector provides integrated lighting with reduced glare; light reflector can be wall-mounted or free-standing. • Integrated microphones provide better frequency pick-up and shielding to block mobile and wireless device interference. 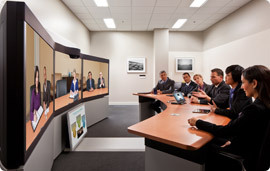 • The Cisco TelePresence Touch 12 panel allows users to initiate and manage meetings with “one-button” simplicity. TX9000 Operations and Performance Benefits Compared with its predecessors, the TX9000 Series offers: • A 20-percent reduction in bandwidth consumption for exceptional video quality • A 50-percent increase in the number of speakers and improved speaker placement for three-channel spatial audio • Easy installation, configuration, management, and use; room remediation is simpler than competing products *1080p60-capable hardware; functionality to be delivered in a future software release. For more information or to see a live demo at a Cisco facility, please call HB at 800.243.4414 and ask for Sales or email sales2@hbcommunications.com.